(Nanowerk News) The Canadian research community on high-temperature superconductivity continues to lead this exciting scientific field with groundbreaking results coming hot on the heels of big theoretical questions. The latest breakthrough, which will be published March 20 in Science ("Broken translational and rotational symmetry via charge stripe order in underdoped YBa2Cu3O6+y"), answers a key question on the microscopic electronic structure of cuprate superconductors, the most celebrated material family in our quest for true room-temperature superconductivity. 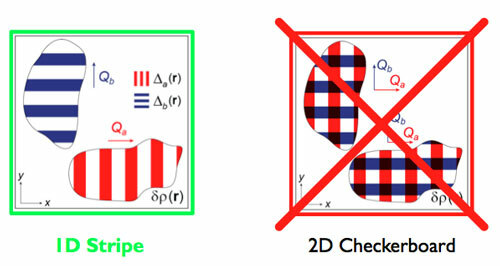 Sketch of the static patterns for (a) 1D stripy charge order and for (b) 2D checkerboard charge order, within the 2D Cu-O plane. You can also also think of the superconducting electrons like cars on a highway, all moving the same speed and direction, the picture of efficiency. But the charge-density-wave state acts like a patterned traffic jam: no movement, anywhere.